Violinist Pavel Ilyashov has been applauded by audiences throughout Europe, Asia, and the Americas for his performances as soloist and chamber musician. The Miami Herald described his playing as a "breathtaking display of virtuosity and rhapsodic expression", while the St Louis Post Dispatch hailed him as "a virtuoso from head to toe". 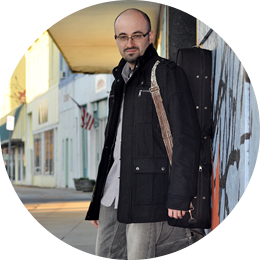 A graduate of Philadelphia's renowned Curtis Institute of Music, Pavel has performed chamber music with Yo Yo Ma, Jaime Laredo, Paquito D'Rivera, and members of the Guarneri, Orion and Emerson String Quartets. Pavel's performances have been heard on the popular radio program Performance Today. A debut CD under the sponsorship of the Buder Charitable Foundation was released to critical acclaim. Other recordings can be heard on the Naxos and Albany record labels. Recent engagement highlights include concerto performances with the Virginia Symphony, a series of recitals at the Caramoor and Bargemusic festivals in New York, as well as an extensive tour of North and South America featuring a program of works written for unaccompanied violin. Pavel is a full time member of the Virginia Symphony and a substitute violinist with the Philadelphia and Chicago Symphony Orchestras. In addition to performing, Pavel is a passionate and dedicated teacher. He has taught masterclasses at festivals throughout the Americas. Currently, he is on the faculty of the Governor's School of the Arts and maintains a small private studio. This summer, Pavel looks forward to performing and teaching at festivals in Virginia, North Carolina, and New York State.